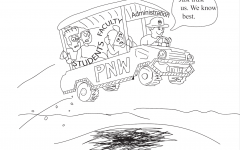 It should be known that a lot of PNW students do not like that “Northwest” is being added to the diplomas in Spring 2019.
they make decisions that solely affect students and do not include us in the decision-making process. At least give us the choice to opt out of having “Northwest” on our diplomas. I understand the efforts to promote the Chancellor and the Northwest campus “GO PRIDE”, but with all due respect, this is only going to put PNW graduates at a disadvantage when competing for jobs, especially against West Lafayette graduates.